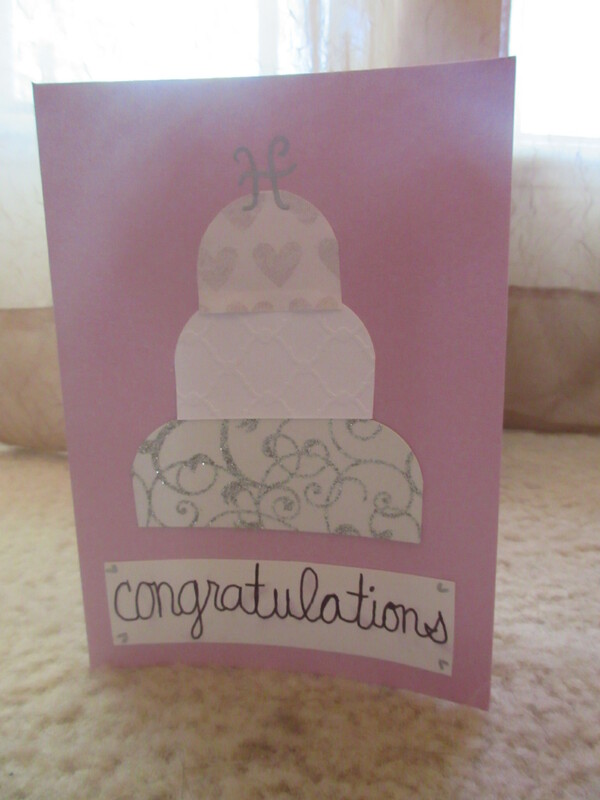 I measured each cake layer to 1.25″ tall to fit the card well. Then I trimmed the middle and top layers’ sides at my own discretion. Corner rounder step was last. Paper is difficult to cut using the corner rounder. It’s a good idea to put some card stock behind just to hold it steady when using the punch. I used a silver Metallic Sharpie for the letter on top of the cake (the couple’s last initial) and the hearts in the corners of the congratulations banner at bottom. It was difficult to fit the word “congratulations” at the bottom just right. I practiced several times to get it right, then wrote in pencil, traced in Ultra Fine black Sharpie, waited for the Sharpie to dry, and attempted to erase. Erasing is difficult on glossy card stock. But I knew the glue would hold better on the matte side. This entry was posted in Cards, DIY, How-To and tagged card, congratulations, DIY, greeting cards, how-to, wedding cake, wedding card. Bookmark the permalink.